To make up for lazy days and eating out (which equates to unhealthy eating), I decided to devote the weekend to cooking... and the first thing on the menu - pesto pasta! Pesto, for me, is an acquired taste. You'd either love it, hate it, or learn to like it. I am more of the last part. To be honest, it's not a first choice for me, but it'd turned out okay (Though J says he'd rather have aglio olio over pesto). On the good side, it's the healthier option too. Pesto is typically made from basil leaves, extra virgin olive oil, pine nuts, cheese and minced garlic. With these ingredients readily available, it'd be relatively easy to whip up your own pesto sauce right in your own kitchen. For my case though, I got Genovese pesto from the supermarket. Whipping up the pesto pasta took me less time, this is definitely a healthier version of a "fast-food!" Add the pasta water, pesto and mix, ensuring that it has been combined evenly. To add a bit of zing, I added a bit of chili flakes. Garnish with parmesan cheese and tomatoes. * Recipe adapted from here. 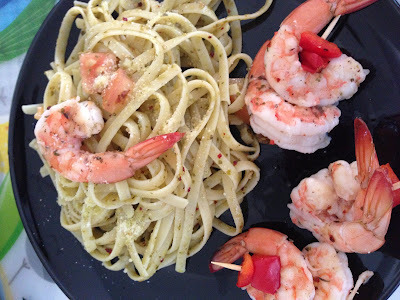 Pesto pairs well with seafood, so I complemented the meal with skewered grilled prawns. On a grill pan, grill the shrimps and capsicum until cooked. Note that it only takes a few minutes for the shrimps to cook, and if you want it to be a bit juicy instead of dry, don't wait for the grill marks to show. Arrange the grilled capsicum and shrimps on the toothpick. Plate and serve. The hubby, though not a fan of pesto (like me), loved the meal!